One of the great players of the 70’s and 80’s Gamal Awad died suddenly in his sleep in Alexandria suffering from a massive heart attack. He was 49. 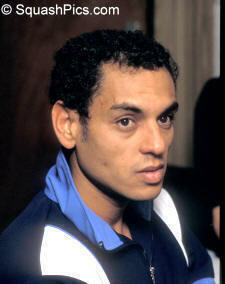 Awad was twice British Amateur champion, British Open runner-up and holder of the record for the longest match in squash history (with Jahangir Khan) of 2 hours 46 minutes played at the Patrick Chichester Festival in 1983. Awad was affectionately known as ‘Grasshopper’ or ‘Rubber man’ for his acrobatic performances in which he bounded and rebounded around the squash court like a bouncing rubber ball. He had amazing reflexes and his retrieval powers often involved him in diving full-length to return the ball. He was Amateur champion in 1977 and 1978. The year he beat Maqsood Ahmed of Pakistan at Wembley (1977) was long talked about as one of the most spectacular finals of all time. In the 1980 World Master he beat Geoff Hunt finally losing of Mohibullah Khan in the final. In 1982 he defeated Hiddy Jahan in the semi-final but again finished runner-up to Jahangir Khan. He had an exuberant and warm personality, was easily distracted, an exuded a confidence that rubbed off on those around him. Born in Alexandria 9 August 1955 he lived in Dartford in Kent for some time and was based at the Horsham Squash Club. “He had many friends on and off the court and will be sadly missed,” said the Horsham Men’s Club Captain Julian Bidlake. It is very sad indeed. He was coaching in Greece for almost 8 years at the All sport club in Athens . 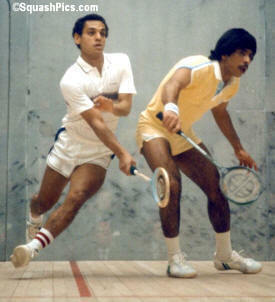 Gamal was my coach as a junior and he taught me the smart style of playing. He was such an ordinary man that inspired you and gave you the target. He was also Nikos Moustroufis' coach (10 times Greek champion) and with Gamal he made an unbelievable breakthrough just losing to Gamal El Amir from matchball in Egypt ! In our training he used different ways for doing that as pushing cars and putting chairs on the training court ! We spent also a lot of time together and I will always remember him.